Our Engineering Mechanics Tests allow you to experience an online examination in the real-time environment. In every online test on Engineering Mechanics, you will be presented with Multiple Choice Questions (MCQs) which will test your skills in Engineering Mechanics Concepts in a detailed and comprehensive manner. In the test, each question will have 4 options to choose from. You should select only 1 correct option as an answer and then move on to the next question. Once you submit answers to all the questions, you will be given your final test score. In the Online Engineering Mechanics Test, for every correct answer, you will be given 2 points. There will also be negative marking of -1 for every wrong answer. So, you will have to be more careful in choosing the answers to the question in your online examination. If needed, you should skip to the next question and come back to the previous question later so that you can do proper time management for the online mock tests. 1. "Engineering Mechanics Practice Tests" - In Engineering Mechanics practice tests, there will be a series of practice tests wherein you can test your Engineering Mechanics concepts on every chapter separately. There will not be any time limit on these tests. So, Engineering Mechanics Practice Tests should be the first set of tests which you should attempt. Goto these practice tests here. 2. "Engineering Mechanics Mock Tests" - In Engineering Mechanics mock tests, there will be a series of mock tests wherein you can test your Engineering Mechanics concepts on every chapter separately, but there will be a fixed time limit per test. So, it is similar to Engineering Mechanics Practice Tests, but with an added constraint of time limits. 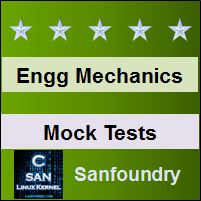 You should try Engineering Mechanics Mock Tests if you are appearing for any online examination soon. Goto these mock tests here. 3. 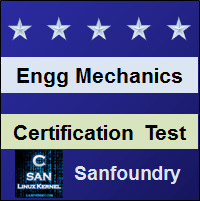 "Engineering Mechanics Certification Test" - Once you are through with your Engineering Mechanics concepts, then you should try our Engineering Mechanics Certification Test wherein Sanfoundry will issue a free Certificate to you if you scored either Grade A* or Grade A in Engineering Mechanics Certification Test. Goto Engineering Mechanics Certification test here. 4. "Engineering Mechanics Internship Test" - If you are interested to do Internships in Engineering Mechanics at Sanfoundry, then you must take our Engineering Mechanics Internship Test. If you scored either Grade A* or Grade A in Engineering Mechanics Internship Test, then you are eligible for Internship at Sanfoundry in Engineering Mechanics. Goto Engineering Mechanics Internship test here. 5. 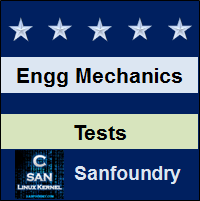 "Engineering Mechanics Job Test" - If you are a fresher, a dropout, an experienced person and if you know Engineering Mechanics well and looking out for jobs in Engineering Mechanics domain at Sanfoundry (or our Network of Companies), then you should try and qualify our "Engineering Mechanics Job Test". 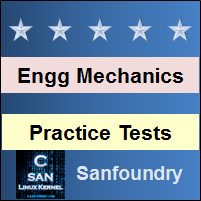 If you scored either Grade A* or Grade A in Engineering Mechanics Job Test, then you are eligible for a Job at Sanfoundry (or our Network) in Engineering Mechanics domain. Goto Engineering Mechanics Job test here. For every "Engineering Mechanics Practice Test", Total Questions: 20, Total Time: Unlimited. For every "Engineering Mechanics Mock Test", Total Questions: 20, Total Time: 20 Minutes. For "Engineering Mechanics Certification Test", Total Questions: 50, Total Time: 1 hour. For "Engineering Mechanics Internship Test", Total Questions: 50, Total Time: 1 hour. For "Engineering Mechanics Job Test", Total Questions: 50, Total Time: 1 hour. Before you get started on these series of online tests on Engineering Mechanics, you should learn, study and practice our collection of 1000 MCQs (Multiple Choice Questions and Answers) on Engineering Mechanics here. We also prefer that you should practice Engineering Mechanics practice tests and mock tests completely before attempting the certification test. Here is the list of online practice tests and mock tests on Engineering Mechanics. Each online test focuses on a "Specific chapter of Engineering Mechanics". So, you should try both practice test and mock test on every chapter to do a self-assessment of your knowledge (along with time-limit constraints) in every area or sub-topic of Engineering Mechanics. Engineering Mechanics Certification test, Internship test, and Job Test are mentioned at the end of this list. 1. Engineering Mechanics Test 1 – This set of online test on “Engineering Mechanics” tests your skills on Addition of a System of Coplanar Forces, Cartesian Vectors – 1, Cartesian Vectors – 2, Dot Product and Cross Product – 1, Dot Product and Cross Product – 2, Three Dimensional Force System, Moment of a Force – 1. 2. Engineering Mechanics Test 2 – This set of online test on “Engineering Mechanics” tests your skills on Moment of a Force – 2, Moment of a Force – 3, Moment of a Force on a Specified Axis, Moment of a Couple, Simplification of a Force and Couple System – 1, Simplification of a Force and Couple System – 2. 3. Engineering Mechanics Test 3 – This set of online test on “Engineering Mechanics” tests your skills on Reduction of a Simple Distributed Loading, Conditions for a Rigid-Body Equilibrium – 1, Conditions for a Rigid-Body Equilibrium – 2, Two and Three Force Members, Equilibrium in Three Dimensions, Constraints and Statical Determinacy, Different Free Body Diagrams. 4. Engineering Mechanics Test 4 – This set of online test on “Engineering Mechanics” tests your skills on Simple Trusses – 1, Simple Trusses – 2, Method of Joints, Zero Force Member, Method of Sections, Frame and Machines. 5. Engineering Mechanics Test 5 – This set of online test on “Engineering Mechanics” tests your skills on Space Trusses, Internal Forces Developed in Structural Members – 1, Internal Forces Developed in Structural Members – 2, Shear and Moment Equations and Diagrams, Relation Between Distributed Load, Shear and Moment, Cables, Bending Moment Diagram. 6. Engineering Mechanics Test 6 – This set of online test on “Engineering Mechanics” tests your skills on Shear Stress Diagram, Cables Subjected to a Distributed Load, Cables Subjected to its Own Weight, Characteristics of Dry Friction – 1, Characteristics of Dry Friction – 2, Characteristics of Dry Friction – 3, Problems Involving Dry Friction. 7. Engineering Mechanics Test 7 – This set of online test on “Engineering Mechanics” tests your skills on Wedges, Frictional Forces on Screws, Frictional Forces on Flat Belts, Frictional Forces on Collar Bearing, Pivot Bearings and Disks, Frictional Forces on Journal Bearings, Rolling Resistance. 8. Engineering Mechanics Test 8 – This set of online test on “Engineering Mechanics” tests your skills on Centre of Gravity, Centre of Mass, Centroid of a Body, Composite Bodies, Theorem of Pappus and Guldinus, Resultant of a General Distributed Loading, Fluid Pressure, Moment of Inertia for Areas. 9. Engineering Mechanics Test 9 – This set of online test on “Engineering Mechanics” tests your skills on Moment of Inertia for Composite Areas, Product of Inertia for an Area, Moments of Inertia for an Area About Inclined Axis – 1, Moments of Inertia for an Area About Inclined Axis – 2, Mohr's Circle for Moments of Inertia, Mass Moment of Inertia. 10. Engineering Mechanics Test 10 – This set of online test on “Engineering Mechanics” tests your skills on Radius of Gyration of an Area, Work – 1, Work – 2, Conservative Forces, Potential Energy, Potential Energy Criterion for Equilibrium, Stability of Equilibrium Configurations. 11. Engineering Mechanics Certification Test - This set of online free certification test on "Engineering Mechanics" tests your skills on all areas (all chapters, topics and subtopics) of Engineering Mechanics. 12. 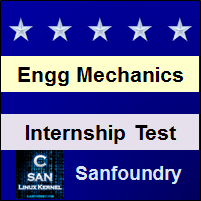 Engineering Mechanics Internship Test - If you scored either Grade A* or Grade A in our Engineering Mechanics Internship Test, then you can apply for Internship at Sanfoundry in Engineering Mechanics. 13. 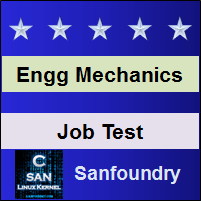 Engineering Mechanics Job Test - If you scored either Grade A* or Grade A in our Engineering Mechanics Job Test, then you can apply for Jobs at Sanfoundry in Engineering Mechanics domain. Best Wishes for your Engineering Mechanics Tests!